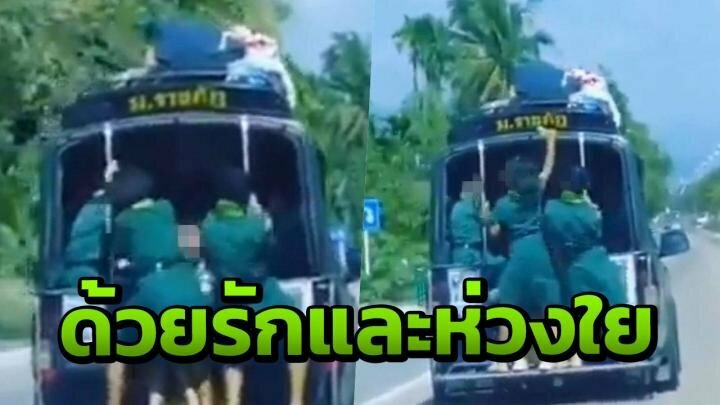 Video: Thais show their concern for "Gyrating Guides"
Thai Rath reported that concerned netizens showed their concern after a pair of girl guides were seen strutting their stuff hanging onto the back of a song thaew in Southern Thailand. But not all took it seriously saying that kids should be left alone to be kids. Thai Rath quoted a number of posters after the video was uploaded to "Khon Tai Jai Tem" on Facebook. It looked like the incident happened somewhere in Thailand's south. Wasuporn Naka said: "You are young women - that's not nice. It's also dangerous and in the event the driver brakes sharply you could fall down and die". Napat Limsawat agreed saying that the driver would be in trouble if there was an accident. However Sunisa Ritthiuklap remembered her own school days: "It's just kids having fun being kids. The teachers should advise them about safety." No more fun allowed in this country!? but not about the "real" issues. Geez Wasuporn, get a life.......they are a couple of girls having a happy moment. Lets face it they have precious little to look forward to as it is. Well what are you supposed to do when you grip a chrome pole? There are some real low lifes on this forum. How do they equate young girls having fun with their predilection for whores in Pattaya? These guys should hang their heads in shame at their thought processes, it borders on paedophilia. For goodness sake, it's just a couple of girls having a good time. Sure it's dangerous but we all did unsafe stuff when young. The guy with the dash-cam should have backed-off a bit instead of trying to get a close-up; he would have creamed them if they had fell-off! I sometimes wonder if any Thai driver has anything between their ears! Damn I say. Use my motto. Bagpipers put the FUN back into Funerals. Let kids be kids, until they 85 yo OK. Probably 'creamed' himself looking at them. They'll be lucky to reach that age. Personally I'd be far more concerned about that atrocious (yet normal) lack of safety in the mode of transport than the dancing. Where do girls dance like that on silver poles? I don't remember that lesson from dancing school. Yes, they have fun. And even if they do more or less the same as gogo dancer doesn't mean they will end up as gogo dancers. Maybe you should relax a little. And maybe also look up the definition of pedophilia. The teachers should advise them about safety. Advise....A little more effort wouldn't hurt. I've seen these "school transports" in Nakhorn si Thamarat, packed with children, going over 100kmh. Just unbelievable.